Note: All hiking maps on this page were created with TOPO! State Series (Colorado) mapping software, unfortunately no longer available for most states, and provided here with permission of National Geographic. See general site nationalgeographic.com. TOPO! (National Geographic) Copyright 2011. GPS tracks were imported from Garman Etrex Vista portable receiver. 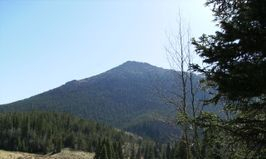 Trail to Horse Thief park and to ridge high-point above pancake rocks. Start at parking lot at closed tunnel on HWY 67 between Divide and Cripple Creek. Take (Yellow track) trail E up steep old logging road along stream in deep gully to left and which levels off after 15-20 minutes in a meadow with a stream from N and another from E. Continue E till intersect with Pancake Rocks trail to right (S). Take Pancake Rocks trail to S which switchbacks up to a saddle on ridge. Continue over saddle on trail for about 1/2 mile generally SE, to where the trail climbs more steeply E and S to another saddle (north yellow diamond & coordinates on map). Instead of following the trail on to Pancake Rocks (at south yellow diamond), bushwhack SW through the woods about 100 yds to find the bare rock ridge-the top extending to the S, and dropping off gently. Nice lunch spot, fun rocks. There are depressions etched into the horizontal surfaces in which, when filled with rainwater in summer, micro critters can be seen swimming about. Good views to W and S towards Cripple Creek. Trail to Horse Thief park and Sentinel Point (MAP4). Start at parking lot at closed tunnel on HWY 67 between Divide and Cripple Creek. Take trail (yellow track) E up steep old logging road along stream (in deep gully on left) and which levels off after 15-20 minutes in a meadow with a stream from N (and another meeting from E further along). Cross creek to left and take trail N along open meadow, following the creek from N on your right. Sentinel point is the pyramid shaped mountain directly E. Trail bends to NE, enters forest and starts climbing steeply up, circling N and E around Sentinel Point. Trail thru forest is very steep and marked by rock cairns, up past treeline in a stream gully leading up to a saddle between Sentinel Point to SW and a ridge from Pikes Peak to the NE (gully to saddle has a nice snow field to hike/slide on in May). Once on saddle, hike up to rock outcropping on Sentinel Point. Nice lunch spots and views all around. Mt. Rosa - There are lots of ways to Rosa - the one I like is from the parking lot above Helen Hunt Falls. Take the trail to the top of St Mary's Falls (above) (Purple track on NE part of map). The trail continues SW along a slowly climbing valley, turning into an old rough 4WD road (red track segment drawn on map), and connecting to an improved 4WD forest road at R01START on the map. About 50 yards N along the road, the trail up Rosa leads off to the left (W), where it switch-backs up to the top of the ridge to the North of Rosa. Walk south along ridge to peak. About 8 miles from parking lot.